Corrected, on both counts. I believe there was a German match on, but I wasn't really paying attention to it. We were watching the 10am Arsenal match. 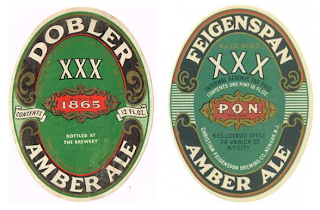 According to post-Repeal articles and ads from Dobler, they were a draught-only brewery in the pre-Pro and Prohibition Era (somewhat unusual for a keg-only "cereal beverage" brewery, since most near beer was bottled). Feigenspan added a bottling line at Dobler at Repeal, and then a larger one a few years later. 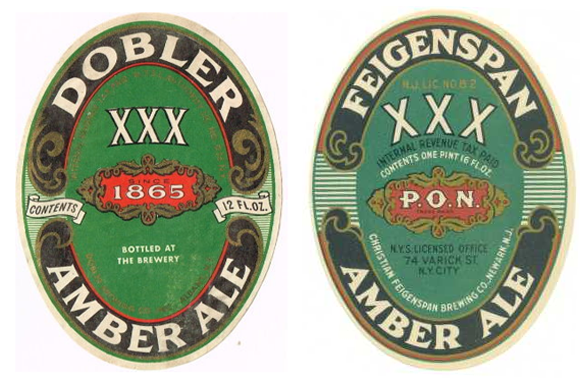 Feigenspan's, as one of the largest Northeast brewers in the 1900-1920 period, marketing region extended to upstate NY even before buying Dobler in 1919 "to make 2.75% (abw) beer" went the reports at the time. (That being the limit of WWI's Lever Act's "War Beer" due to grain shortages and it was hoped by brewers it would remain so after National Prohibition was enacted). Even after Repeal, it appears that Feigenspan marketed both Dobler and Feigenspan beers in NY state - I've got a mid-30s ad for Dobler P.O.N. Bock that mentions that Feigenspan's P.O.N. Bock is available in Keglined cans (Dobler itself wouldn't add a canning line under after WWII in 1950). 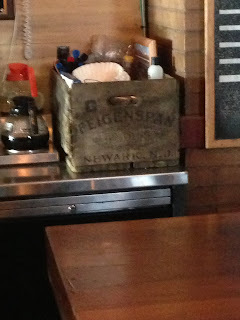 I imagine the Albany brewery acted as a distribution warehouse for Feigenspan beers as well as its own (?) in the 1933-43 period - which could explain the wooden case's origins? 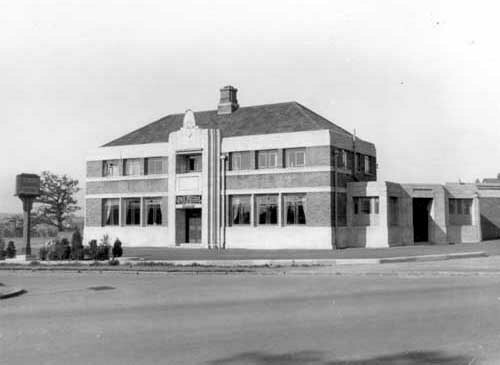 Dobler wouldn't close until the late 50s - in 1959 - the brand and brewery bought by Hampden-Harvard in MA. 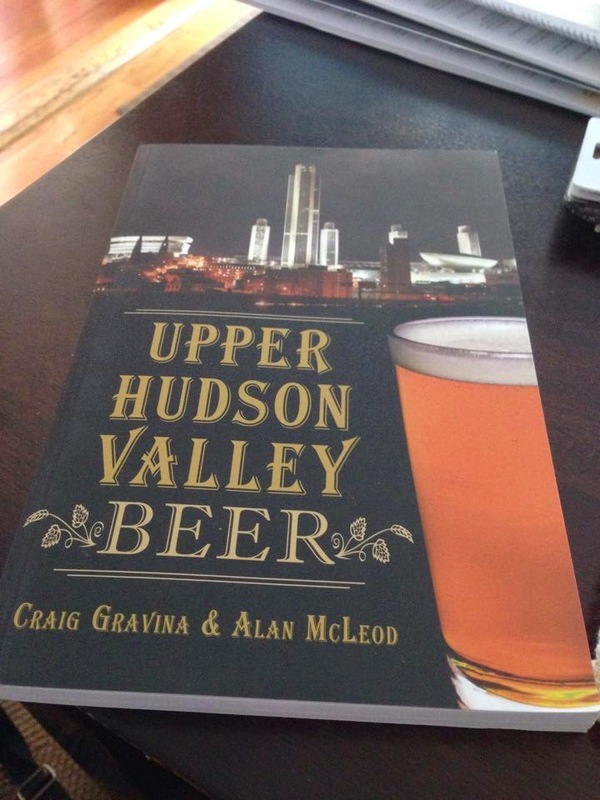 At first H-H claimed they would re-open the Albany brewery after needed renovations but that apparently never happened. but the sale does explain how Piels acquired the Dobler brand - HH and Piels were both once part of the national Associated Brewing Co. chain. Not sure how long Piels continued making the brand. I read somewhere once that Feigenspan tried to change the meaning of P.O.N. to be "Pride of a Nation" (which would have made even more sense for Dobler's P.O.N.  branded beers) but I don't recall ever seeing any contemporary evidence of that. ...if anyone is interested, but not a lot of info on the Dobler subsidiary. Woo-hoo! At least I got some things right. There's a great photo from 1939, of a car—all by its lonesome—on Route 20 in the Nassau, NY area. To the right of the photo is a billboard advertising Dobler P.O.N. Jess, you should check that site out, some great Feigenspan billboards and signs from the 1930s and 40s. 1959, you say? I thought I had seen 1953. Maybe that's when Dobler stopped brewing the P.O.N beer. Anyway, you'd know better than me! All fixed. A bunch of Krueger and Ballantine images, too. re: P.O.N. - from "Pride of Newark" to "Pride of the Nation". Thanks very much for the history lesson. I wouldn't have guessed Feigenspan brewed in Albany. Did you buy the box from them? I'd have tried. Unless Dolores was with me, in which case I'm pretty sure it would be vetoed.